If you have any questions or want to enquire about dates, use our form to contact Tiina Carr or see their website for more information. Sheffield is a friendly city, an arty hub that’s full of surprises, a fact ably demonstrated by this stunning small hotel. It sits amid leafy streets, with a smart park to the front, then hills beyond that ripple over to the Peak District. Picasso stayed here when he attended the World Peace Conference in 1950, though things have changed a little since – a recent refit has turned this into a small-scale pleasure dome. Downstairs, there’s a Scandi feel in the café/kitchen, with joggers and dog walkers swapping the park for delicious smoothies or a slice of cake. Bedrooms are divine, as good as they look. Expect the best white linen, smart neutral colours, the coolest bathrooms with robes and organic oils. 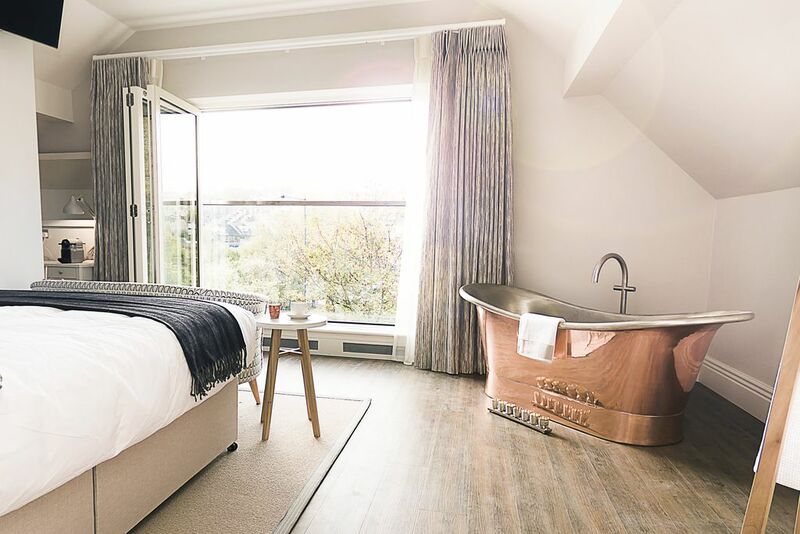 A vast window in one room opens to frame the view; another has a free-standing bath; all are named after birds, their colours reflected in the fabrics. Back downstairs, tasty food waits at night, perhaps cauliflower and pistachio fritters, rib-eye steak with wild mushrooms, spiced plum crumble with vanilla ice cream. Don’t miss the Millennium Gallery, the Winter Garden or the cool streets around you. Breakfasts from £7. Lunch from £7. Dinner from £12. Sunday lunch from £16. Extra bed/sofabed available £35 per person per night. Have you visited Brocco on the Park? Be the first to leave a review. Wake up to birdsong and the babble of the Porter Brook, thanks to our parkside location. Choose from Endcliffe Park or the Botanical Gardens. Enjoy a stroll, picnic or hike out to the Peak District via Bingham Park. Welcome to the UK's greenest city! Ecclesall Road is the heart of social Sheffield. You're spoiled for choice in this vibrant neighbourhood and its mix of local independent shops, bars and galleries. Nearby Sharrow Vale Road is a food-lover's dream, jam-packed with delis and local produce. You're only minutes away from Sheffield city centre and its cultural attractions of Sheffield Theatres, Millennium and Graves galleries and art house cinemas. Stop awhile in the glorious Winter Garden, an elegant glasshouse filled with exotic flora. Beyond Sheffield's centre to the east, you'll find shopping mecca Meadowhall, where big-name stores meet boutiques. Try Motorpoint Arena for major entertainment events or the English Institute for Sport and Ice Sheffield for every kind of sport imaginable. Sheffield was built on industry. Find out more about its proud heritage by hopping a taxi to Kelham Island Museum. The David Mellor Museum at Hathersage is dedicated to the industrial and product design of one of Sheffield's most famous design sons. Follow Ecclesall Road a few miles south, and you'll be in Sheffield's back garden: the Peak District National Park. Lovers of the outdoors will find plenty to do, while heritage enthusiasts should head for Chatsworth House & the historic town of Bakewell.